Over the past few months, I’ve become more and more interested in the ancient philosophy of Stoicism. I’ve read several books and blogs, the philosophy just seems to make sense. The more and more I find out about it, the more and more it I realize just how much it aligns with this whole FI mindset. The main belief in Stoicism is that events are neither good nor bad, they just happen. What makes them good or bad, is our emotional reaction to them. Therefore we can control whether the world is good to us, or bad to us. It’s all simply a matter of mindset. Like FI, the premise is simple. For FI the theory is: spend less than you earn, invest the difference. But just because something is simple. It doesn’t always mean it’s easy. It’s extremely hard to see the world around you reward the undeserving and punish the innocent and think to yourself these events are neither good nor bad. When someone insults you, or steals from you, or injures you in any way, it’s tough to say, this is only bad because of my reaction to it. And there in lies the strength. Events that I can control – IE: Whether or not I eat lunch. The Stoics attempted to divide the events of the world into these three buckets. They concern themselves with items in Bucket 1, and ignore items in Bucket 2. But there’s that third Bucket that’s the kicker. Where do we draw the line, and how do we handle events we can sort of control with out driving ourselves nuts? Can I sort of control how popular this blog is? Well, now let’s think about this. What goes into making a popular blog? So, looking at that list there are some things that I can control and others that I can’t. I can definitely keep creating fresh content. But, I can’t really decide if you think it is any good. And I certainly can’t hold a gun to your head to make you come and read it in the first place. So, what part do I create goals around? How do I put the Stoic philosophy to work on these events that I can sort of control? I’m going to set goals for myself on the parts of making a “good blog” that I can control, and leave the rest up to the powers that be. I create the best content I can, on a regular basis and I hold myself to that. The rest I can’t really worry about, if you like it, great! If not, great! I did the best that I could and that’s all I can really do. So, why are we talking about Stoicism? It’s a stupid silly joke, but quite frankly I’m curious to see all the net worth updates and how upset everyone is. Why did this strike me as odd? Well, because there’s no real reason to goal yourself on Net Worth. Wait… WHAT??? How can I say that you shouldn’t have a goal based on your Net Worth? And what exactly can we control in that? We certainly can’t predict or control the value of our investments. If you can, please send me an email, we can make a LOT of money together. But, here’s the interesting thing. The larger your nest egg gets, the less and less control you have over the value of it. Let’s say I save $5,000 a month. And I have a net worth of $100k. The market dips 1% and I still save my $5,000. My net worth increased by $4,000 and I am closer to my goal. Now, let’s say I have a $1MM net worth. What happens if the market dips 1% and I still save my $5,000 a month? My net worth goes down $5,000!?! Should you be upset about that? Maybe, but there’s not really that much you can do about it. The market is going to do what the market wants. And the more you put into it, the more control it has, and the less control you have. We all know that there is a limit to the total net worth that we need. We are all striving to hit that magic number of 25x expenses, in order to pull the trigger. But, that total net worth number is an output of some diligent saving and an agreeable market valuation. And since we only need to worry about what we can control, I propose you concern yourself with your savings rate, or your absolute savings number, not so much your net worth. These are inputs to your net worth that you can directly control, and track. Want to gain more revenue? Network to gather more clients, or change your prices to gain more money from each client. Want to lose some weight? Control your eating, and make sure you get up and workout every day. Want to increase your net worth? Save as much as you can from each paycheck and invest it in a smart and sensible way. Want to increase your blog readership? Put out the best content you can on a reliable schedule. If you concentrate on the controllable input and enjoy the process of it, the output will come. As an added benefit, you won’t drive yourself batty attempting to control the uncontrollable. Great post, Mr WoW! It is a very thoughtful way of expressing what I’ve felt for some time. It’s not useful to set goals for things that you can’t control. I do find it interesting that in this community of control freaks, people try to control things they only have partial control over, while in my every day life, many people I know feel powerless to control the things that they have almost complete control over. I.e. spending, debt, making progress towards life goals, etc. It’s quite amazing isn’t it? People get so concerned with things they have no say over. Yet, feel completely helpless over things they can very easily control. Human nature I guess. Great post and I love the perspective. A person can only control their actions – not the result! This is why I don’t talk about net worth all that often on my blog… instead, I focus on “what gets measured, gets managed”. Daily and weekly disciplines will lead to much bigger successes than checking personal capital and seeing where we are in the random walk will. I agree with “what gets measured, gets managed” but, if you are measuring something you can’t control, you’ll end up spinning your wheels and making no progress. You need to determine the input, and determine the input that you have control over. Then you can track your progress and make strides to your overall goal. The interesting thing about net worth is that your impact on your net worth declines as your net worth increases. If you have a net worth of $0 or less, your actions are almost always the sole reason they go up or down. Pay off debt, save more, your net worth goes up. As investments take up a greater percentage of your net worth, those movements begin to dominate any changes. It can be very disconcerting at first. You’ve done everything right but the benchmark you use, your net worth, goes down. And goes down massively! I think it’s a function of not recognizing that the part you can’t control has become a bigger part of the benchmark you’re using. Once you realize that, and how you have to avoid the random walks and look at the trend over time, many people often look to another measure for their financial goals. Jim Wang recently posted…CashCrate Review – Is It a Scam or Legit? Very insightful. I feel like it’s a bit of maturity that comes along with investing. When small market moves dwarf your monthly income you start to realize it. Thanks dude. I needed to hear this today. I’m gonna break down my goals into things I can and can’t control. Totally agree with net worth tracking BTW. It’s good to track, but the further you get along the FIRE path the more useless the tracking becomes! Glad it was helpful. It’s been really helpful as we move through things. Just concentrate on what we can control. That’s the important part. I’ve always been pretty big into Stoicism. There’s so much out there in the world that I can’t control so why let it affect how I live my life? I did set a Net worth goal this year but about a month after I realized there was no real point as so much of it is out of my control. Luckily I did set a savings rate goal as well so focusing on that and on my way to accomplishing it! That’s awesome! congrats! I’m so glad for you. Keep controlling what you can. And you’ll do just fine. Ah, yes, bucket #3. For those, I sort out the factors I can control from the factors I cannot, and try to encourage good outcomes by moving what levers I can. On “bigger nest egg, less apparent progress”, that brought me to see net-worth as a mere proxy for my real measure: how much of my FI-life expenses am I covering with current residual income. Doesn’t matter what the current market prices are, I’m unchanged at x% of my FI income target. Just bought 45 shares of T to add to my dividend stocks — cool, now I’m 0.25% closer to FI! That’s a great way of looking at it as well. Although one could argue that the dividend payment is out of your control as well. But, to each their own. Just concentrating on the levers you can pull is the important part though and that’s all it’s about. Why spend four days of the week wishing it was Friday, when you can’t control that? That tenet is one that I have been exploring more of as well. Enjoy each day as if it was your last, it’s a sobering and grounding way to look at life. That’s not to say YOLO and waste everything today, but to enjoy and make the most of each one. It’s another tough part of the journey. Why would you waste four days of your week just waiting for the weekend? Your wishing away 80% of your life!! I’m not familiar with Stoicism so thanks for the intro. I really like dividing events into 3 categories. It’s a great way to look at life. I try to keep a positive outlook whatever happens, but it’s tough sometimes. Net worth isn’t one of the things I worry about. 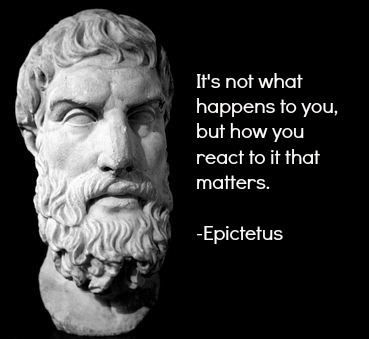 Stoicism is a really interesting philosophy that has been gathering a little steam and it actually has a lot in common with the outlook on life that we discuss in the FIRE community. Great stuff dude, welcome to the Stoics club! I was sporting that shirt proud at FINCON wasn’t I? I’ve been trying to incorporate the philosophy in my life more and more over the past 5 years. I’m not going to lie, it can be very challenging at times, but everything worth doing is, right? You were wearing that shirt, in fact I was going to use an image of it from your site as the headlining image, then thought you might get mad. Regardless, I’ve been trying to follow this more and more, and I think it’s a great way to look at life. It certainly is tough, but that’s why it takes practice and time to master. Like most things worth doing, they’re tough, but that’s what makes them worthwhile. Ha, I wouldn’t have cared a bit – actually if it helps me sell another one I’ll get a whopping $1.60 richer!!! Well now I know. And watch out.. $1.60!! you’ll be rolling in it in no time. Also, I need to talk to you about the t-shirt business. Once everything calms down, I want to look into that. For sure, hit me up whenever! I have used this philosophy in my teaching career with respects to students, administration, and parents. Thank you for showing me another area to apply this to. Of course, I’m glad that you can use this in other aspects of your life. It’s a great way to be. And hopefully it helps move you toward your goals. I agree with you, it’s not all about net worth. We have been on a frugal journey since we started our FI journey at 22 years old. I measure so much, savings, net worth, expenses. It’s helped me help us stay on track. I do have to tell you, seeing our net worth climb has been positive reinforcement. The only reason I found out about the dip was because of Twitter! Investments are all on automatic pilot according to our IPS statement. You started at 22?!?!!? Holy Crap! You’re gonna be done before you know it. I only wish I had learned about all these things at 22, and not only learned about them, but actually listened to any of it. It’s definitely positive reinforcement, but the goals need to be more something that we can control. Depending on your net worth, these last few weeks probably weren’t all that pleasant. i think i might have been a sort of stoic for some time now. i bought that “good life” book and couldn’t get very far through it but like the concepts in the reader’s digest version, which you summarized nicely. it’s interesting watching the numbers on the screen say you’ve “lost” about 50,000 dollars in a week but that’s a good problem to have if the snowball is a good size. i didn’t know our net worth until about 2 years ago when i read your money or your life and went and told the mrs. “i think we have a million bucks.” it’s not like we bought champagne afterward like when we paid off our house. You know it’s funny. We hit certain milestones and I mention it to the Mrs. and she says, “Oh Ok, cool” and continues making tea. It’s kind of amazing when you are living a pretty good life, and you aren’t anxiously awaiting something to come and change that. I think that is a vitally important point. Even when working, make your life as good and joyous as you can. great post, we can’t control the market, just our reaction to it. I embrace the set and forget index fund investing strategy. I do a monthly check in of assets (including retirement accounts) but it doesn’t hold too much sway with me. I control my incoming paycheck (thank goodness) and allocate those funds into various goal categories. I am fortunate that I have this income and control over how I spend it/save/invest. Love the comment about “flipping the script” to look at things as positively as you can, for me, this attitude has brought more positive outcomes my way. It’s a tough thing to do, but if you can train yourself to look for the positive in things, the world is a much different place. It take practice and patience with yourself and others, but it’s actually quite amazing. I say that like I’m good at it… HA. I’m still learning and giving it a go. If you haven’t already, read “The Ancient Art of Stoic Joy” by William B. Irvine. It’s the book that turned me onto stoicism, and has a great chapter on circles of control (which remind me of this post!). That book was actually a major inspiration for this post. It’s a really great book, that I need to read again. Hopefully I will be able to continue using those methods to move forward in my life and gain more “stoic joy”. Thanks for writing this Mr. WoW. I think I really need to be a better stoic. I always get frustrated by the things I can’t control, and it bothers me to no end. I should probably take a page or two from stoicism and incorporate it into my life. Hopefully it’s helpful. This book is really good: “The Ancient Art of Stoic Joy” by William B. Irvine You can look into it and see. It’s actually a major inspiration for this post. Haha! I love it. You got one fertile mind, my friend. I think I have a better title for this post: Dr. WoW: How I Learned to Stop Worrying and Love the Volatility of the Market. But seriously, great post. Are you familiar with Brian Johnson? If not, check out his YouTube channel when you get a chance. Very big on Stoicism. I love his playlist Old School Classics. Anyway, that’s my pathetic contribution to this wonderful post. Cheers. I don’t know if I love the volatility in the market. I mean I know it’s a necessary evil, but this past month has been a bit fun to watch. HA. Oh, well, I need to stop paying attention so much, which is the exact opposite of what most people need to do. I will make sure to check out that youtube channel. Check out https://dailystoic.com/ if you are into this stuff as well. I see more and more people talking about this concept of thinking. I suppose from an investment standpoint it makes sense. We can research all we want to buy the investments we may think will improve our financial situation to achieve our goals. But at the end of the day, we don’t control the output. It takes the emotion out of investing I suppose. Mr. Wow, this is a fantastic post! You are so right to identify Stoicism as being the “operating system” for living what I call an Elite Life. FI is the outcome of this operating system as it relates to our financial lives. Just imagine the change that we can make in all the other aspects of our lives (financial, relationships, career, etc.) if we used Stoicism as the operating system…the Mindset…for everything in our lives. Mr. Wow you are spot on! You are so right. Operating system for living. We just have to concentrate on what we can control and it’s going to work out just fine for us. I’m into stoicism but my main thrust is the teaching of Heraclitus who’s major contribution is the only constant is change, to wit I say all time travel is forward and the past is just illusion, no longer real. His famous saying is “you never step in the same river twice”. Stoicism is not so much about reacting as riding the thread into the future. Sometimes the thread turns down, but that does not mean you can not change it! You merely step out and into a different river. Market investments have both return and risk. Return is for the good times, we ride the returns UP. Risk however is Return’s constant companion. When return falters and risk rears there is NO REASON to ride the risk into the ground. A 60/40 portfolio returns 7.41% with a risk of 8.93%. S&P returns 9.23% with a risk of 14.8%. 1.8% more return (19% difference) with an added 40% MORE risk. Half as much extra return for twice as much extra risk. 40/60 has 6.53% return and 6.24% risk. 89% of the 60/40 return with only 70% of the risk. The solution is step out of the 100/0 or 60/40 river and into the 40/60 river in a downturn. Don’t just watch your money evaporate. You will have all that bond money to reinvest in stocks on the way back up! Oscillating your AA around 60/40 and 40/60 improves your risk profile and improves your compounding over decades. You are always in the market so you don’t make the mistake of getting out you merely take a little risk off the table. I think you are on to something with the variations in portfolio allocation. I just know that I will know the proper times to adjust it down or up depending on what the market is doing. I think I’ll keep it at a preferred allocation and just let it ride. That way I don’t have to worry about it. At the moment, we’re really heavy in equities, but as the time draws near we will start loading up on bonds. Just a theory I have on that. But again, it’s a personal thing. Thanks for the insightful comment on Stoicism as well. I always thought that tracking your net worth was more so you could set better and clearer financial goals for yourself. Not that your net worth was the goal itself. True, but the larger it gets the less and less control you have over the total value. So really I think, setting goals based on things that are fully in your control make more sense. Focus on the circle of influence rather than the circle of concern.